Plans to build a 10-mile barrier along the Thames to protect London from flooding are being considered. The embankment, from Sheerness in Kent to Southend in Essex, would contain gates to allow water to flow in and out of the Thames estuary. Climate change experts say the existing Thames barrier, built in the 1970s, may not be able to cope with rising tides. The Big Ben clock tower, Westminster Abbey and the Tower of London would be damaged by flooding to central London. Scientists for the Thames Estuary 2100 project, set up by the Environment Agency to assess flood risk and river management over the next century, say the barrier would be an option if sea levels started rising faster than expected. 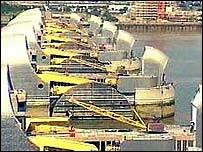 Peter Borrows from the Environment Agency told BBC News: "London enjoys a very high standard of defence thanks to the Thames Barrier, other barriers and the embankments downstream. "But man's activities are causing global warming leading to rising sea levels." He said the Agency was considering how best to protect London up to the year 2100. "The Thames Barrier will continue to be operational after 2030 although the standard of defence it provides will gradually decline - which is why we are looking to maintain that standard." Under the new scheme, the barrier would contain numerous gates to allow water to flow in and out of the Thames estuary according to the tides. But the gates would be shut if a flood seemed likely.